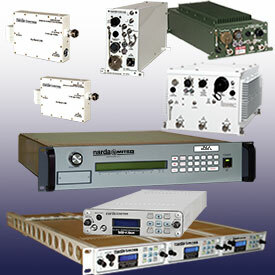 L3 Narda-MITEQ manufactures an extensive line of Satellite Communication Up and Down Frequency Converters that include Block Fixed Tuned Frequency Converters, Synthesized Tunable Frequency Converters, Multiband Frequency Converters and Discrete Frequency Converters for both the Commercial and Military Markets. These SATCOM Upconverters and Downconverters are available as single, 1:1 and 1:2 redundant systems that ensure continuous operation. 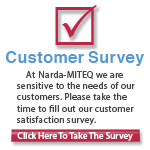 L3 Narda-MITEQ's line of Upconverters and Downconverters cover C, DBS, Ka, Ku, L, S and X Frequency Communication Band's. They are available for both commercial and military applications. By using L3 Narda-MITEQ's discrete line of Multiband Converter products you can cover several of these frequency ranges at once. Both indoor rack mounted or ruggedized outdoor antenna mounted units are available with a host of options. NEW Space Saving, patented, 1/3 rack 1RU high Converters. These unique, full function space saving, patented, converters offer the same performance and options as our full rack units but require 1/3 the rack space of a traditional unit and are only available from L3 Narda-L3 Narda-MITEQ: 1/3 Rack Block Converters Applications, 1/3 Rack-Mounted Block Converters, and X-Band 1/3 Rack Block Converter Two-Slot System.